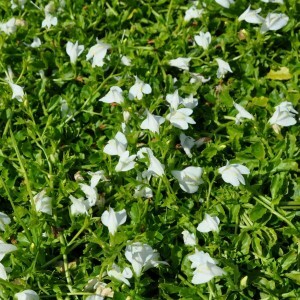 This ground cover plant of the family of Scrophulariaceae grows in the most different corners of the globe. More than 40 types of a mazus grow in the Central and East Asia, India, Indonesia, Australia, New Zealand, Japan, Korea, Russia and other regions. And the homeland of a mazus are the Himalayas. The beauty of this tiny ground cover plant bewitches. And though in height it seldom exceeds 5-8 cm, this shortcoming is excellently compensated by rapid growth. Mazus expands simply promptly, it is the main distinctive feature of this plant. Mazus reminds the elastic carpet created from the thin small stalks, gear dark green leaflets and bright blue flowers with the golden-yellow or snow-white center. The form of flowers of a mazus is very unusual and attractive – they have two lips, top short, and lower – is slightly longer, is covered with specks.